It is just hard to say anything looking at these old pictures. 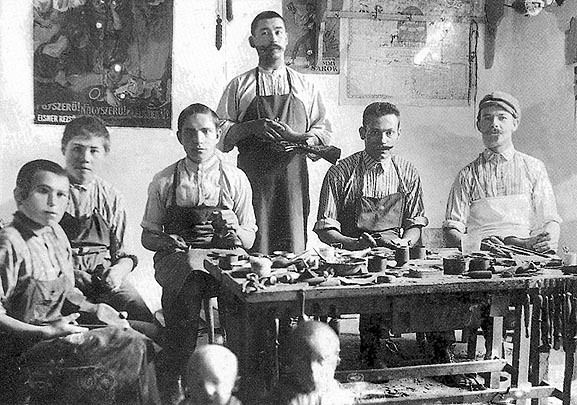 Even those small children at the front of the picture must have been gone a long time ago, but most probably our old tools were somewhere there – in those old workshops. No machines, no fancy Italian chemicals, perfect synthetic glues, bright lights, clicking machines, brand new computerized sewing machines, 3D CAD-CAM systems (and I can continue much-much more) helped their work, but you can feel shame looking at their work in museums. Tiny little stitches, wonderful edge finishes, and uppers, which look like soming out from the finest printers, because those stitches just impossibile to make with anything. I didn’t talk about tools: the ones you can get nowdays, are mainly garbage. 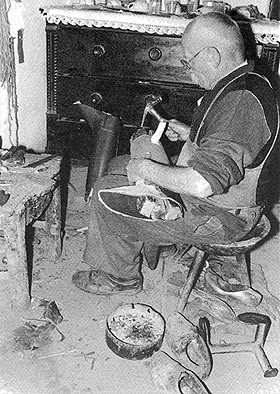 In those times the good toolmakers learnt shoemaking just to understand the demands better. There were a big competition about quality and ergonomy. Now the makers produce our tools from cheap materials, don’t worry about any ergonomy, sophosticated look, whatever.. It is a pity. I had a conversation in an American shoemaker forum about “who is a master”? Well, we represented a perfectly different policy about it.The European one is quite clear – if you have a certification, you are a master, if not – you are not. So, there are no “hidden” masters – if you don’t know it about yourself, you are just not. Simple, isn’t it? Some of my great collagues there think that master is only a category for beeing independent, and making nice work. Well, it seems reasonable, but I don’t agree. Not just because I am a traditional guy, but we must keep some traditions. No doubt the shoe making seems to become a hobby. Well, why not? But.. it shouldn’t mean dealing with the traditions. If you are a hobby shoemaker, and make it as a second carrier – congrats, but deal with it. You could have choose to become a MD, Phd, whatever – you would never claim to use those titles, don’t you? Anyway: people are different, just like their opinion, but there should be some things over judging by opinions: TRADITION, and respecting them.